The Mars Ship saw an even more drastic change, shrinking from 60 m in length to 41 m while all cargo and crew was now positioned on top. This layout won out over two others. The first featured the propellant tanks in the nose, above the pressurized crew compartment, with the unpressurized cargo bay sandwiched between the crew and the engines. This layout offered easy cargo and crew off loading and improved stability after landing due to being bottom heavy. Unfortunately, due to the propellant feedlines cutting through the manned areas and the cargo bay, it had the worst crew environment, less cargo space and the highest dry mass. The prior default layout resolved the crew environment issue by moving the crew on top, placing the propellant tanks in the middle, and leaving the cargo bay on the bottom. This layout afforded greater stability during landing at the cost of less easy crew offloading, but was ultimately rejected in favor of the crew and cargo sections being placed on top together. This layout was 9% and 8% lighter than the prior two layouts, a huge advantage for the high delta-v return from Mars. It also offered more commonality with its Tanker stablemate, which would trim manufacturing and design expenses. These advantages were considered worth the cost of inferior landing stability and reduced ease of offloading. SpaceX would compensate for this layout’s inferior offloading characteristics by adding a gantry crane for moving heavy cargo down to Mars. The crew would be able to get down to Mars via an egress raceway from the 1100 cubic meter pressurized compartment. In addition to these changes, the engine configuration saw the addition of a sixth vacuum engine, bringing the total number of engines on the Mars Ship to nine. The vacuum version of the engines were to be 5.5 m long and 3.8 m in diameter, while the landing engines would be considerably smaller. All nine of the engines would fire after stage separation to minimize gravity losses of the 1,750 tonne vehicle, with the landing engines shutting down when no longer of benefit. The engines would be fed from propellant tanks containing 1,450 tonnes of propellant. They would be protected in turn by a unique interstage aero shell, which covered the engines but not the rear. This arrangement offered protection with minimal mass. The Ship and its Tanker stablemate would both enter the atmosphere on their sides. SpaceX had considered capsule entry, but nixed the idea after finding that it made protecting the engines very difficult. Side entry, in contrast, protected the engines, spread the heating over a wider area, and was lower mass thanks to the benefit of integrating the structure with the heat shield. 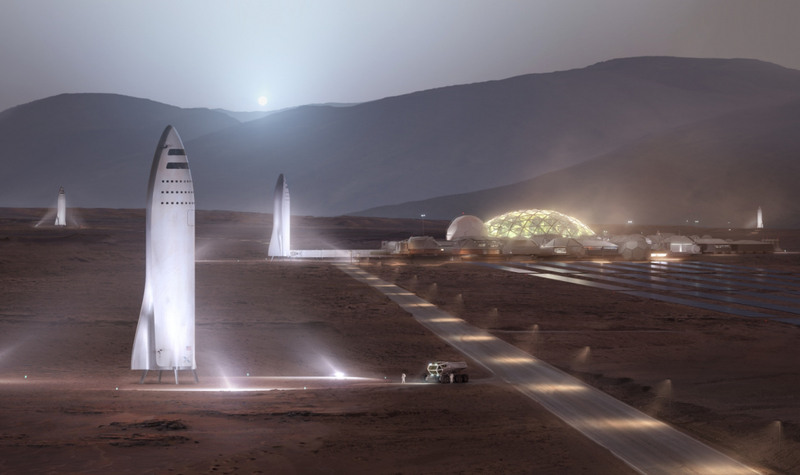 In a development anticipated by NSF expert Dmitry Vorontsov, SpaceX modified the Tanker to use enlarged tanks that could hold 1,650 tonnes of propellant. 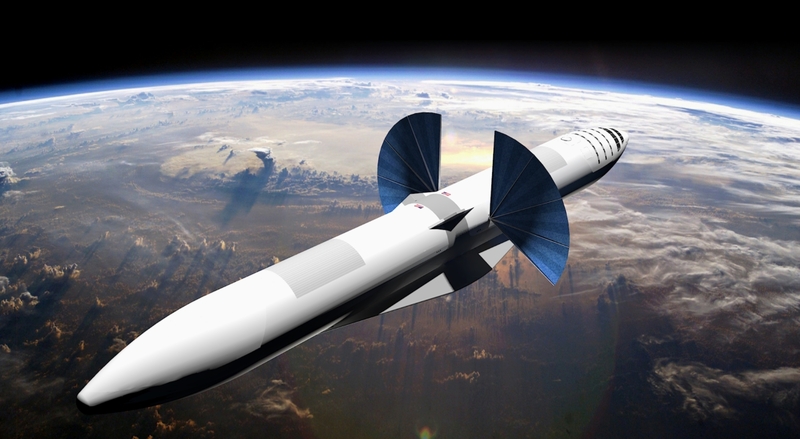 This change would allow the design to carry substantially more propellant into orbit. At 27 meters, however, it would be much shorter than the Mars Ship. In order to swing the vehicles around from side entry to engines first for final landing, NSF learned that SpaceX considered using aerodynamic surfaces, engine gimbaling, differential throttle or a combination. The Ship and the Tanker would both feature a docking port on their backs with automatic couplers. Three options for refueling were considered, including capillary action, diaphragm tanks and settling the tanks via rotation and pressure assist. The latter was selected due to the prior schemes not being practical for such a large design. The firm anticipated that one Tanker would be refueled by several others first before transferring all of the propellant at once to the Mars Ship. This would minimize exposure of the passengers and crew to microgravity and radiation while cutting consumption of food supplies. NSF learned that other design elements for both the Ship and Tanker had also been decided upon. One element was the use of spherical header tanks inside the propellant tanks to hold propellant used for landings. This would be done to prevent the sloshing of propellant from causing a critical engine flame out during atmospheric entry. The Ship would feature water, brine and solid waste storage around the upper edges of its oxygen tank. Above this storage, the unpressurized cargo hold would be located. It would feature two 3 meter tall decks supported by a central column. This area would contain power systems, thermal systems, un-deployed solar arrays, radiators, life support, air handling, storage and avionics. Cargo would be transferred out of a large cargo door via an extending gantry crane and lowered to the surface. The pressurized section above could be entered into via an airlock attached to a docking port. It would feature the same central support column as the cargo bay. There were to be four levels, with three 2.5 m tall floors for crew, food and crew accommodation, and a much larger top level. This level contained the crew mess and launch/landing seats. The vehicle’s nose contained control thrusters to control its fine movement. One element in flux was the extendable landing legs of the Tanker and Ship, of which there were five but which they were going to be heavily upgraded in size and durability. 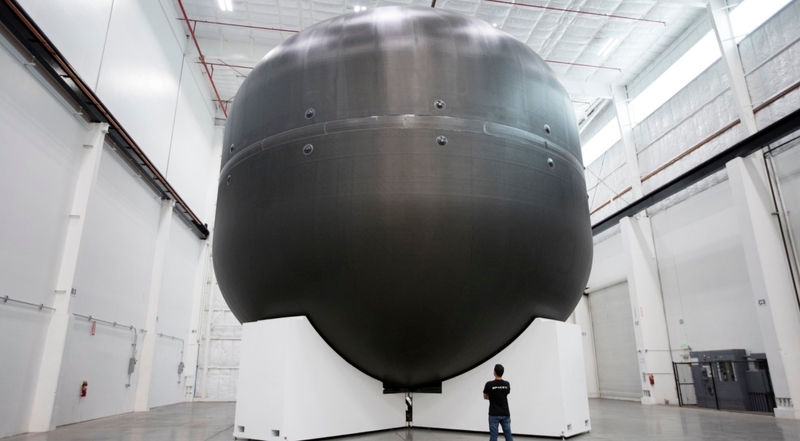 SpaceX decided that instead of just using carbon fiber for the propellant tanks, the booster’s structure would be entirely made of carbon fiber, as would the Tanker and Ship. 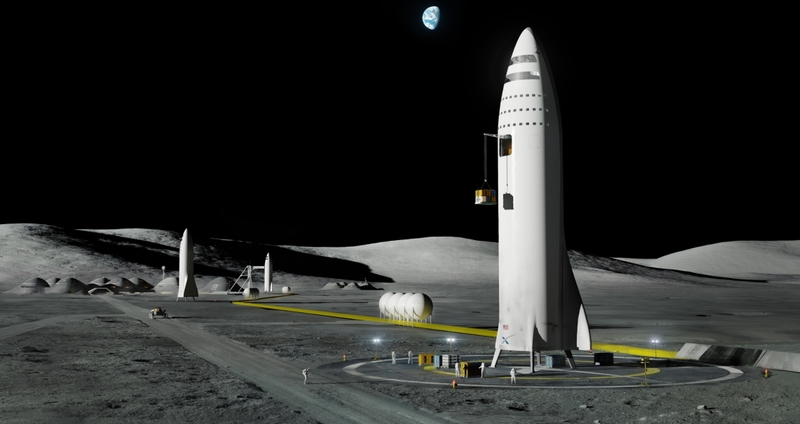 Photo of the tank, via Elon Musk’s 2017 IAC speech. SpaceX made this decision due to carbon fiber benefitting reusability via its higher fatigue limits, as well as its greater geometric stiffness. This was vital, as it would no longer be possible to efficiently prevent propellant tank buckling via ullage gas pressure due to the vehicle’s size and use of autogenous pressurization.